Is running that familiar marathon distance getting routine? Have you raced too many half-marathons? Does the 10k simply lack the appeal it once had? 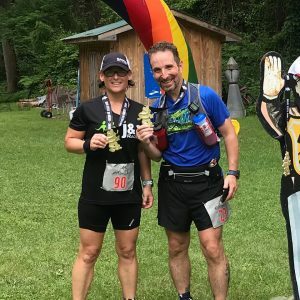 When you get tired of the traditional races try one these unique distance/format races to spice up your running and racing relationship. Stage Races: Whether it’s the Last Annual Vol State 500k or the TransRockies 120-mile run in the Rockies…a stage race just might be what you need to re-light your endurance flame. Set over multiple days the race distance is broken into manageable but challenging segments to test your endurance moxie. What these multiple day races offer, is a chance to test yourself over increased distances, running on successive days, and an opportunity to bond with fellow runners over a large period of time. It’s one thing to show up to a race, run, finish, and cheer on a few friends. The time you will spend with your fellow races over multiples days will create lifelong bonds. Personal Experience: I have not run a stage race, but it is something I am interested in doing in the future. Timed Events: A marathon has a definitive finish line, you either run 26.2 miles or you don’t. To mix things up try a timed event such as a 6, 8, 12 or 24-hour event where you log as many miles as you can in a given amount of time. The winner isn’t the one who crosses the finish line first, it’s the runner who can manage their body, their emotions, and the race conditions while keeping their will to keep moving intact for the entire period of the timed race. Personal Experience: I’ve run 13 timed races, 12 x 24-hour and 1 x 12-hour. I cut my teeth and learned a lot about ultrarunning and myself running 24-hour races. My best outing is 96.725 miles. Last Person Standing Race: There are various formats of varying distances and time but here is the idea. This distance and format I borrowed from Jimbo’s East Coast Summer C.R.A.P. Fest: A timed loop race over a 1.6-mile trail loop. For your first-time round, you get 37 minutes to complete the loop. After 37 minutes, you start lap 2 – this time you get 36 minutes. The third loop you get 35 minutes, then 34 minutes, and so on. If you miss the start of the next loop, then your race is over. The last person running “Standing” is the winner. A version of this race format lasted 67 hours at the Big Backyard Ultra. Personal Experience: I have not run one of these events, but this format intrigues me. It appears like a balancing act between pacing and endurance. Relay Races: Tired of running alone? Try a 200ish-mile relay race with a bunch of your family, friends, and or co-workers. In this concept, teams are comprised of between 12 and the minimum number (normally 4) of runners your Race Director allows. Teams cover the race distance with each team member running their “share” of the 200-mile race. The non-stage running members pile in a van and meet up at the next exchange point to launch off the next runner as they take on their stage. This routine is played out over 30+ hours. The team with the lowest accumulative time wins. Teams also compete in some unofficial team heckling, van decorating, and other mischiefs along the way. Personal Experience: I’ve run 1 relay race. The Colonial 200 in 2012. I ran the event with 5 of my friends. This race ranks as one of my all-time favorite running experiences. We ran, we laughed, we ran some more, and we laughed until we lost our turkey Subway sandwich. It happens to the best of us. One day you’ll get bored, your eyes and your heart may wander. It’s okay, the Stage Race, Timed Events, Last Person Standing, and Relay Races are wonderful avenues to test your endurance, have some fun, meet new people, and scratch the running and racing itch. This entry was posted in Uncategorized on October 30, 2018 by burk.brian@yahoo.com. My Marathon Motivation – Days prior to the race a young child, a friend of ours, lost his battle with cancer. He would be buried on Sunday, race day. I can’t imagine the pain of losing a young child. Linton’s favorite color was red and it was with a heavy heart that I dedicated this race to remember Linton James #LJstrong. The Atlantic City Marathon ranks as one of my all-time favorite races. EXPO – Small in size but provided everything needed prior to race morning. I’ve been to the monster size expos and after a while, you realize that you have seen it all before. This expo was intimate and ideally located. I found it easy talk to other runners and the race staff without fighting through a crowd. The race staff provided daily race briefings, highlighting details of the course, answering questions while they kept the atmosphere entertaining. The location of the expo provided plenty of parking and on-site places to eat. RACE DAY LOGISTICS – The start and finish were held on the Boardwalk behind Bally’s casino. There was plenty of covered parking areas available within walking distance. I had no trouble finding a place to park, fast in and fast out after the race. Prior to most races you often have to huddle out in the cold, here, there was plenty of indoor space for almost the entire field to keep warm (on a cold and windy morning), stretch, use the restroom, and get mentally ready to run. I walked to the corral within 5 minutes of the starting time. RACE COURSE – 26.2 miles is a long way…no matter how you look at it. The Atlantic City course offered diversity. We ran along the Boardwalk, around the casinos, among some wonderful homes, and we ran within a small-town setting. The course was always interesting and kept me focused on getting to the next mile marker. Expertly marked and marshaled, I never wondered “which way do I go.” I enjoyed the sites and the support from the local volunteers. Finishing on the Boardwalk with the ocean on one side and the glitter and gold of Atlantic City on the other was awesome! RACE BLING – I really liked the 60th-Anniversary edition of the finishers medal. NOTE: In all transparency, I was provided free entry into the Atlantic City Marathon as a race ambassador. But my feelings and thoughts about the race have not and will not be influenced. RACE REPORT: I did not go into this race with a lofty goal. After a summer of ultramarathon training for Leadville, I did not believe I had much speed in my legs. I hoped I could run another sub-four-hour marathon to keep my streak of three sub-fours in a row alive. Did I mention you should always have a backup plan? At the second aid station, I somehow lost track of the pacer. In the hustle and bustle of the water exchanges, I got separated from the pack. To recover, I thought if I ran a steady pace, 9-minutes per mile, that eventually we would link back up and continue on to a sub-four hour finishing time. Well, that never worked out. Looking back I ran a bit too fast. By mile-3 I realized I was on my own. The upper lollipop section as I’ll call it featured a number of turns and easy to run sections which in hindsight helped me run a bit faster than sub-four hour pace. The route weaved between Brigantine Blvd, Huron Ave, Renaissance Point Blvd, Harrah’s Blvd, Maryland Ave, Melrose Ave, New Hampshire Ave. and back onto the Boardwalk at mile 8. This run along the northern section of the course offered wonderful views of the ocean and Atlantic City. Accepting that I was on my own I told myself to keep my pace no slower than 9-minutes per mile. As I made my way out of this section I glanced at my watch to ensure I was on target. Running on a Boardwalk surface is unlike running on streets or trails. The wooden surface offers a unique feel and the setting along the waterfront offered plenty of distractions. For 5-miles we ran south on the Atlantic City Boardwalk with casinos, shopping, and monuments on one side and the wide-open expanse of the Atlantic Ocean on the other. I thought I would be bored while running 5-miles due south, but the setting here kept me entertained the entire way. If I wasn’t admiring the buildings, I was people watching taking in the collection of welcoming spectators who were braving the cold as they cheered us on. At the halfway point of the Boardwalk, the lead pack of the half marathon crowd came racing past me. It was fun watching them run for the win. At mile 13 we took a right-hand turn off the Boardwalk onto Washington Ave. and then a left onto Atlantic Ave. where we would run 3-miles out to the end of Atlantic to a 180-degree turnaround point. After the turn, we started back along Atlantic Ave. for roughly 2-miles (miles 16 and 17), it was at this point that I caught a glimpse of the four-hour pacer making his way to the turnaround point. I estimated that I had pulled away by a mile and a half. Convinced I had no worse than a sub-four finish in the bag, as long as I kept up my end of the bargain, I continued to motor on. After turns on Monroe Ave, Amherst Ave, Jerome Ave, Huntington Ave, back on to Amherst, Atlantic and the Boardwalk the unthinkable happened. Along this stretch, making my way through the south loop, I caught and passed the 3:55 group. Where once I was happy with a four-hour finish, where once I wanted to stay in contact with the four-hour group now I wanted to keep the 3:55 pacer behind me and if I could to pull away. Passing the 3:55 pace group I now wondered if I could keep up a 7-mile “up-tempo” run to the finish. My plan had always been that if I had anything left, if I had any gas left in the tank that I wanted to put the hammer down on the Boardwalk. The final miles on the Boardwalk seemed like the perfect opportunity to make up some time. On the comforting surface once again I found that my legs were getting very tired, they were happy to run slower but I could not get them into an upper gear. The run up the Boardwalk began to feel like a yo-yo of endurance running. My leg turnover would slow down, I’d glance at my watch and will my legs into a faster pace. This faster pace would hold on for a while and I would taper off, another glance at my watch and another round of mind over tied quads. This back and forth attack went on for two miles. I was happy to click off mile splits between 8:37 and 9:03 . The last mile got tough, I could see the top of the Bally’s casino and hotel but as hard as I ran it seemed to get closer. I believed in my heart I had a good finishing time in front of me but I had not looked at the overall elapsed time function of my watch to see where I actually stood. As my legs drew stiff, and my lungs began to burn I thought for a second it would be okay to cruise to a decent finish. Countering this point was one important thought. Little Linton James fought so hard, his family was in so much pain, I could not give in, I had no right to give into temporary discomfort. 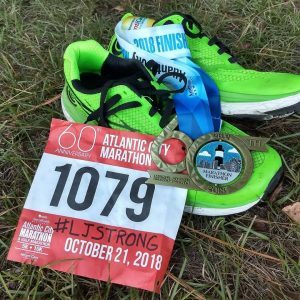 I know in the big picture a PR at a marathon means nothing, but if I could finish strong, if I could finish this race #LJstrong maybe I could honor him and his life. The run to a PR was on. The first person I called was my wife. Hearing her voice on the other end of our cell phone connection I told her I had finished, I told her I had scored a PR and I told her through waining breaths that I had thought about LJ all day. I started to cry. I hope I carried his name in an honorable way, I hope I inspired just one person to look at life differently and maybe one person will fight just a little harder in life’s battles because of Linton James and because I ran #LJstrong for 26.2 miles. This entry was posted in Uncategorized on October 25, 2018 by burk.brian@yahoo.com. My wife and I love the Big Bang Theory. The show is funny, well written and the actor/actresses that play the key roles are very good at their craft. In honor of Sheldon’s list I have put together my list of Running Mortal Enemies. I’m sorry no one person made the list, but I have plenty of running situation enemies. Shocks that fall down and eventually roll up under my foot. That rock that gets into your shoe and no matter how hard you try you just can’t get it to move to someplace where you don’t land on it with every footfall. Running behind a group of friends that no matter how hard you try to pass they seem to move in that direction. Trying to operate my camera phone with sweaty hands and miss capturing the selfie photo of a lifetime. A hill during the end of a race. Want to run a faster race or out run your enemies? Check out my book, 26.2 Tips to run your best Marathon (or any race for that matter.) available on my blog and Amazon. What/who are your mortal (running related) enemies? This entry was posted in Uncategorized on October 16, 2018 by burk.brian@yahoo.com. 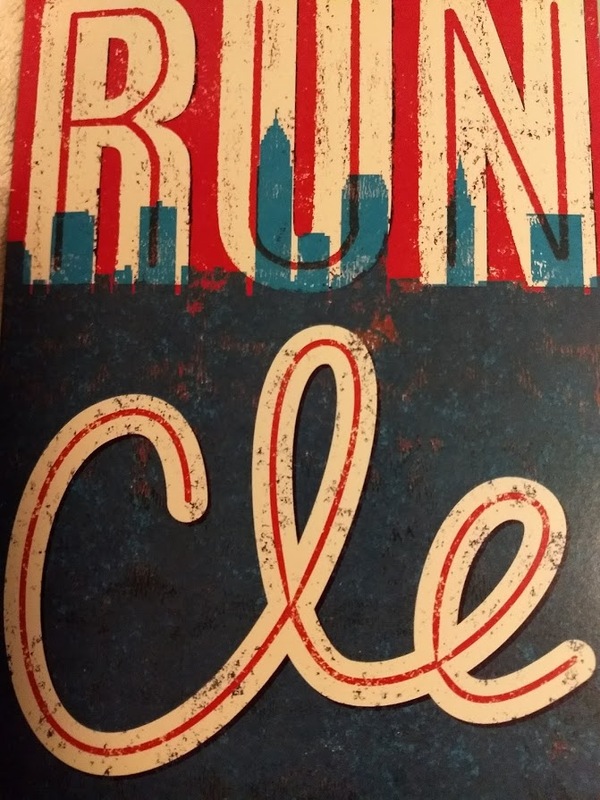 I’ll be returning to North East Ohio to run the Cleveland Marathon series in 2019 and I can’t wait. To help you reach your goals I’ll be posting training tips to help you run your best Cleveland! Tip #8 Have a plan for the week leading up to the race. Do you know what food works best for you the night before the race? How about hydration, do you have a plan to ensure your well hydrated before race day? Success comes in the days before the race as much as it comes during the race. Tip #7 Preview the course. Before race day you should try to get a good feel of the race. Your best performance comes when you know the hard parts, the easy parts and the hilly parts of the course beforehand. Tip #6 If the race course has hills, train on hills. If the course is flat, train on the flats…try to train on the same type, of course, you will be racing on. Tip#4 Have a race day plan and a backup plan. It’s very seldom that race goes off just the way you imagined. It’s best to have a plan and a backup plan just in case something goes wrong. Tip#3 Find a tribe. Many runners find it easier to train for a big race in the company of others. A training tribe/family helps to keep you accountable to your training plan and to your running friends. It’s hard to be a “no-show” when you know others are waiting for you, looking for you and will give you a hard time the next time you do make the training time. Tip #2 Identify your race shoes early. Going into a goal race you don’t want to run in new shoes or shoes you don’t feel comfortable running in. 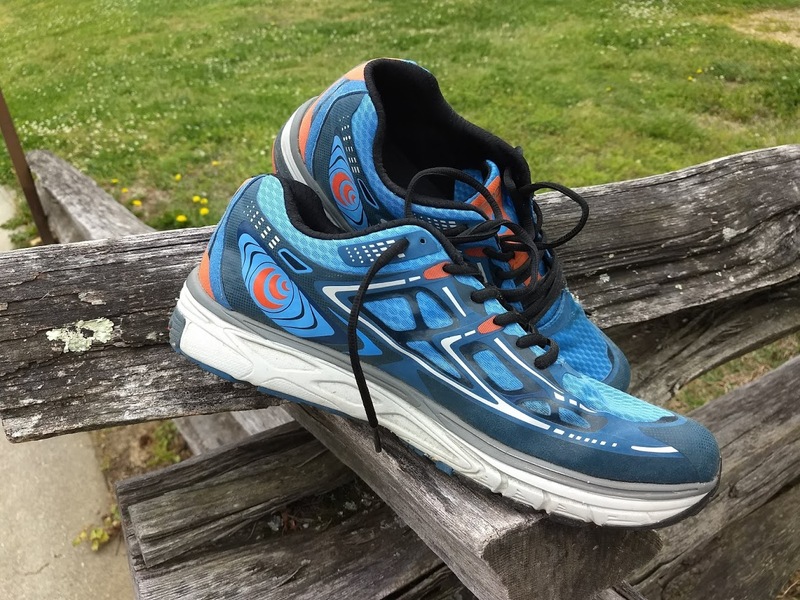 I pick out my race days shoes for my goal race months in advance. I use the months prior to break them in and get them to feel comfortable for race day. #1 To have a successful run at Cleveland, build your base now. A successful marathon begins at least six months before race day. You need a solid base of fitness to maximize your efforts on race morning. Want to run your best Marathon or any race for that matter? Click here to learn the tips and tactics I’ve learned over 18 years of marathon racing. To help you save money, I’ll have a special discount code for my blog followers to save a few bucks on your entry fee. Stay tuned for more exciting news…. Why you should run the Cleveland Marathon. Disclosure: I was selected to be a race ambassador for the Cleveland Marathon and received a free race entry. This WILL NOT influence my posts in anyway. I tell it like it is…period. This entry was posted in Uncategorized on September 20, 2018 by burk.brian@yahoo.com. Five marathons or ultra-marathons races/runs that changed have my life. When I first started on my fitness journey, it was never on my scope to run a marathon or an ultra-marathon. 18 years later I can hardly believe the number of miles I have covered or the lessons that have I learned. Brian’s @Cledawgs list of Five Marathon or Ultra-Marathons Races/Runs that changed his life. 1. My First Marathon - I began my fitness journey to simply get back into shape. At that time, I was a mid-30 something young man who was beginning to feel the mid-life riff. Stepping on the treadmill that faithful day I had dreams of regaining some form of fitness and one day running a 10k where my heart didn’t explode. Maybe in my wildest dreams I could envision a “better” version of me running a half-marathon. A full marathon, that is what “other” people did. On April 24th 2005, in just over four hours, I ran the Shakespeare Marathon. My life would never be the same. I learned much about myself during the nine months of training. I found my spirit during the time it took me to cover the 26.2-miles. After finishing the race, I believed I could do anything I set my mind and my will to accomplish. I became aware that I was capable of being that “other” person, the ones who achieved their goals and dreams. I learned that any task, challenge or ambition could be met if you tackled it one step, one day at a time. Nothing seemed impossible after this race. 2. My First 24-Hour race - I didn’t see it coming. A simple black and white flyer picked up at a local running store enticed me into signing up for a 24-hour race. What was I doing, I asked myself? How hard could it be to run for 24-hours? I reasoned it’s only one day. I started that race alone, one runner among a group of people each testing themselves against the clock. I learned a lot about myself as I struggled in the latter stages of the race. I completed 52.5 miles in just over 16 hours. More importantly I was introduced to the ultra-running community. I learned that your competitors can and will become your best friends and your greatest supporters. I discovered that runners are a community who live, laugh, love and toil together. I learned that each of us while trying to do our best can lift up others around us. I learned that although running is a solo sport it is also a community of friends who understand the challenge of pushing our bodies beyond what we believe are our limits. Running has never felt the same since that day. I continued to run for the finish line as she made her way to greet me. At this point my body was in such pain, and my mind was using every trick in the book to compel me to keep moving forward. With my goal, just a few strides in front of me I couldn’t believe I was going to complete a 100-mile race. As I crossed the timing stripe for the 8th time the volunteer sitting behind the timing table called out my number, looked down at the scoring sheet and said “congratulations.” I remember seeing my wife standing front and center behind a string of yellow tape. I noticed her eyes were full of tears and my running mentor George stood just feet away looking proud of me. I can still recall in great detail when Blake Norwood handed me a Umstead 100-mile sub 24-hour finishers buckle and I remember straining to hold it all together. Blake next presented a girl standing next to me with her buckle, she began to cry and I lost all control. I was a 100-mile finisher and I could no longer keep my emotions inside. I moved slowly but as fast as I could, towards my wife. She hugged me and took me into the cabin to sit down. I was happy to be still. I was so proud I had completed my goal, so thankful to everyone who invested and supported me on my journey to run further than I ever imagined possible. I knew that somehow, 100-miles later, I had become a different person. 100-miles changed my outlook on life. 4. Running the Grand Canyon – It’s sometimes hard to imagine a race or a run being bigger than the total distance. Running the Grand Canyon Rim2Rim2Rim was so much more. The beauty, the friendships, the distance and the struggle to finish left an impression on my soul. It’s hard to capture in words the overwhelming beauty of the Grand Canyon. The colors, shapes, and textures flood your senses. For a brief period, I was not simply a visitor to the canyon I along with four friends were part of the Grand Canyon. We gathered as friends along the south rim, wide eyed, open minded and unsure of what we had gotten ourselves into. I believe each one of us knew we would never be the same. Over the course of the day, over the 44-miles from the south rim to the north and back we shared our excitement, we shared our journey, our experiences, our struggles and we created a bound we will share forever. It’s funny whenever I see a post from anyone of this group on Facebook I instantly remember our run at the Grand Canyon. The Grand Canyon is more than a place to run it’s a life shaping experience on so many levels. Nearly a year later Susan and I ran along the Virginia Beach boardwalk with the finish line celebrations just out of site. “Susan.” I called out in between deep breaths as I tried to keep my composure together. “Susan, you’re going to do it…you’re going to finish the Shamrock Marathon.” I had spent over four hours glued to Susan’s shoulder. I was so proud of her. Susan was a fighter, she overcame some of the scariest health concerns. She was determined, never giving up day in or day out. Susan was the first person I ran with consistently. We ran in the rain, the heat, the cold, through thunderstorms, and in races. Together we ran easy miles and we ran the long hard miles. Susan overcame so much and I learned to open myself up to others. Running was no longer about finish lines…running became about the journey, the adventure, the experience and most importantly about the relationships. Check out my two running related books on Amazon. 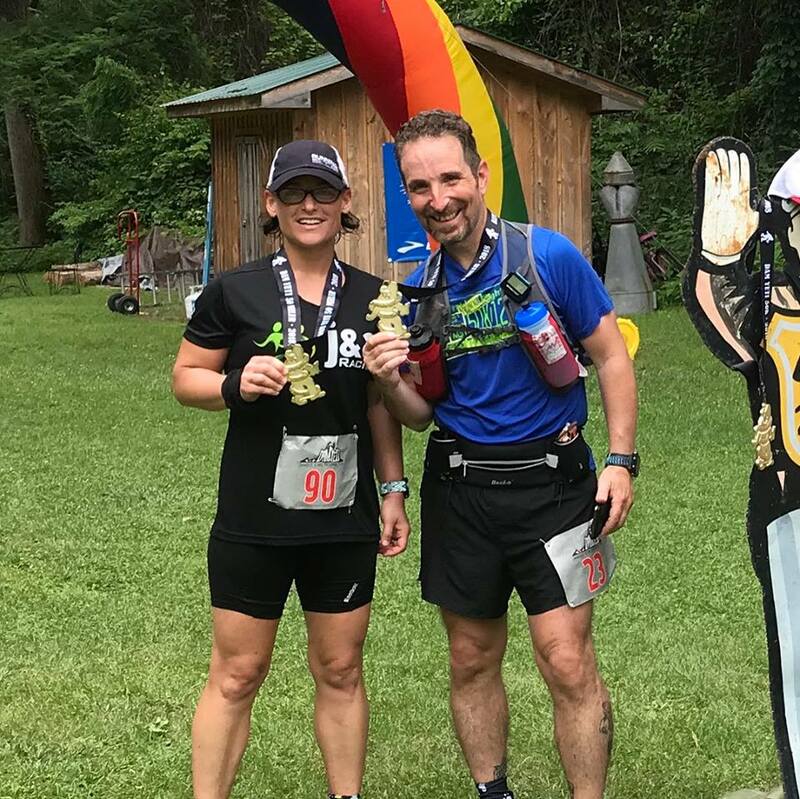 JFK50 (I’ve run this race three times) – to run the one of oldest of ultra-marathons gave me the sense that I had arrived. Graveyard 100k and 100-Miler – I ran the 100k step for step with George N, we finished in the exact time. My second 100-miler made me feel like the first wasn’t a fluke. I ran this race solo. Yeti 100 – Joined the cult. Hinson Lake 24-hour race 2017 - First race that proved I could run for 24-hours. This entry was posted in Uncategorized on September 12, 2018 by burk.brian@yahoo.com. In life and in running it’s important (so I’ve learned) to not take your successes or your failures to serious. It takes a lot of courage to sign up for a race. It takes a lot of dedication to train and prepare for the big day. Likewise it requires a major commitment both personally and financially to show up on race day. If you run and race long enough it is bound to happen…Did Not Finish. So how do you survive a DNF? 1. Accept it. It is what it is…on that day and time you were unable to finish that one race. Plain and simple theirs nothing you can do to change that fact. Like many of life’s challenges the first step in getting over it is to accept it. 2. Remember a DNF does not define you as a person. I get it running is a big part of our lives. It consumes much of what we do, think and plan for. BUT…running is only one part of who you are. You are so much more than the results of a race gone wrong. One event won’t define your life…one race does not make your running career. 3. Give yourself time to grieve. That may sound foolish, but its true. Like anything in life, if it means enough to you…when you lose it it hurts. Allow yourself to mourn the loss of the goal. Acknowledge the pain your feeling. Set aside time to grieve…but limit that time to a productive period. 4. Learn from it. There are lessons to be learned in everything we do. Once you can look back at your race subjectively, rid of the emotions, look at the race to learn where things went right and where things went wrong. 5. Get back on the horse. The best way to move on from the past is to focus on the future. This entry was posted in Uncategorized on September 9, 2018 by burk.brian@yahoo.com. A popular question at ultra-marathon seminars that I give centers around Intervals. Or more specifically…how do you run a successful 50-mile, 24-hour or 100-mile race? 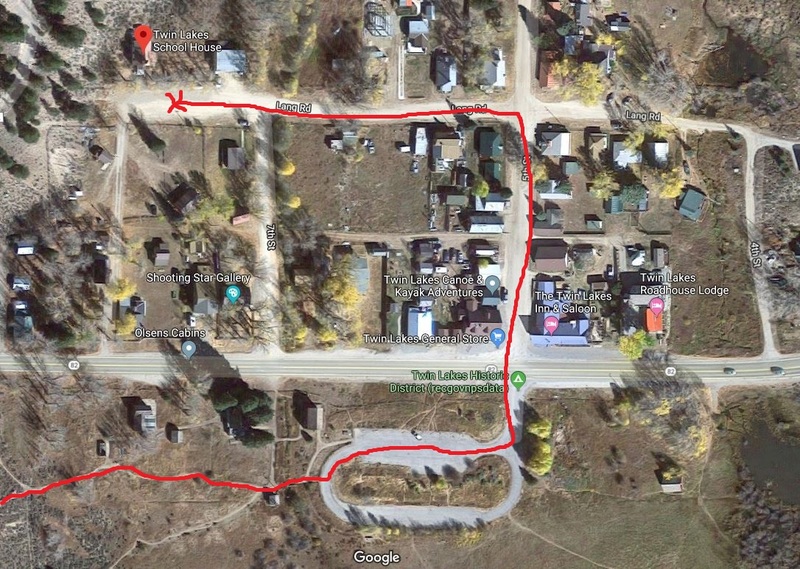 Running to Leadville : A story about a life finally revealed and a terrible twist of fate that turned everything inside out. Also the story of a small mining town and a 100-mile foot race that changes you. Available on Amazon and signed copies here. At my level of fitness/competition, I do not “run” the entire race. 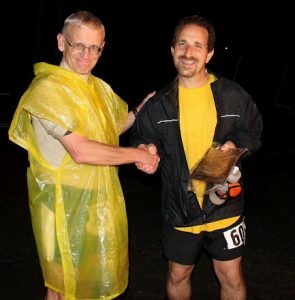 I’ve completed four 100-mile races with a personal record (PR) of 21 hours 36 minutes, and twelve 24-hour races with a PR mileage of 96.75-miles using a run/hike interval approach. An interval approach could be defined as a period of time broken down into a run segment where you run for a given amount of time and a hiking segment where you hike for a given amount of time. How does an interval approach work in ultra-marathons? Going into a race I establish goals…#1 to finish, #2 a successful time goal and #3 a PR time goal. I have what I consider two interval approaches to a successful ultra-marathon. The Pace Per Mile method and the Terrain method. By no means do I believe I’ve invented either of these methods or have I cornered the market…simply outlining how I’ve used them in my running and racing. This method starts with my time related race goals. From those goals, I use a pace calculator, available on-line, to figure out an overall pace per mile. From this overall pace, I figure out a “run pace” and a “hike pace.” It’s not super scientific, I simply take the overall pace and adjust my run pace to run slightly faster than the overall pace to cover the slower hiking periods. 24-hour 100-mile finish = 14:24 overall pace. I can hike a solid 15:30 mile pace for most of the day and can hike faster for shorter distances. I like to use this solid pace as my planning factor. At this hiking pace, I figure I need my run pace to be between 11:30 and 12:30 per mile. During the day, I’ll check the overall pace mode on my GPS watch and adjust my pace(s) to keep on target or slightly better. I’ll run a little faster when needed or slow down if I get to far out in front of my goal or my finish is in jeopardy. If I fall behind I’ll speed up some. Now saying that I will also use the downhills as bonus time. The downhill sections I run as my body allows, cautious to not “over speed” my legs burning them out for the long haul. I take advantage of the down hills to run a little faster to make up time or to stay even with the time I lost on the climbs/time off pace all together (aid stops). I also have pacing plans for the first half of the race and for the second half to account for body fatigue. For races like the JFK50 where the course covers three varying conditions, I’ve had different pacing plans for each section. This method centers around my time related race goals and what terrain the race course offers up. i.e. take what the course gives you. For my first 100 the rule of the day was to hike anything that looked like a hill, smelled like a hill or felt like a hill. I ran all the down hills and flats at a conservative 12 minutes per mile pace. This was a pace from my 24-hour race experience I knew I could keep up. This approach allows you to use the race course to your advantage, make up time where you can to cover time lost on the hills or pit stops. Whatever method you chose, or a combination of methods you decide to run for your race the key is to stay flexible, listen to your body, take what the day gives you and keep moving. I’ve run intervals of 25/5, 9/1, 8/2 and 4/2. I’ve also fallen back to whatever interval I’ve needed to keep me in the race. A 2/1 interval in the closing miles of Yeti 50-miler kept me mentally in the game and running faster than the previous 4/2 had. I finished that race with a 50-mile PR. This entry was posted in Uncategorized on July 25, 2018 by burk.brian@yahoo.com.